Away from the beautiful beaches and lush landscapes of Caribbean serenity, I came across this lil cutie pie while on a countryside tour of Punta Cana last year. 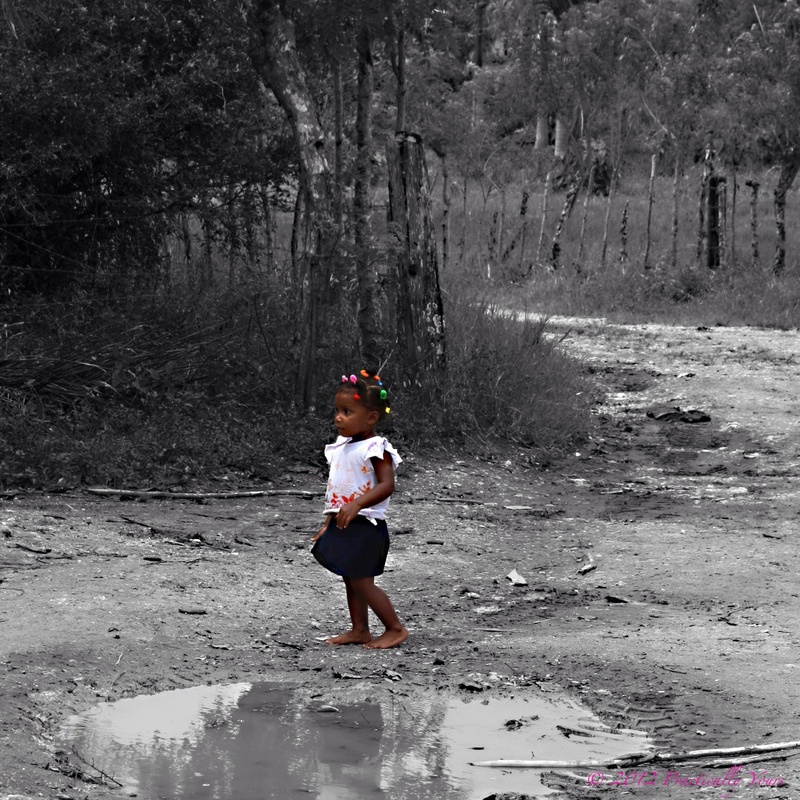 Barefoot and barely fazed, she strolled along a road devoid of hope and paved with neglect. Welcome to the flip side of paradise. The level of poverty surrounding so many popular travel destinations is alarming. What a stark contrast to the pristine, all-inclusive, beach front properties that align the tourist centers of this beautiful city. At the time of my 2012 excursion, Punta Cana’s stats were astounding: inflation over 28%, public gas prices more than $6/gallon ($9 for private gas stations), and if your income exceeded $200/month, you were on your way. It’s the flip side of paradise. And yet, the locals were so incredibly kind. Content even. It was almost as if they had no idea a whole new world existed just beyond the sea. Shoot, the poorest sections of my hometown pale in comparison to poverty-stricken Punta Cana. But sadly, there is such a sense of entitlement where I’m from. The American mindset is to spend more, save less, look good, and buy your way out the bad. Seems we have a wealth of wants and no shortage of greed. It’s pretty ugly, if you ask me. We’re slaves to stuff here in the land of the free. We’re cowards to conflict in the home of the brave. Portions of our paradise are filled with polluted beaches and pools of blood built by the entitled hands of gun violence. It’s not all bad but we sure could do more good for our flip side of paradise. She caught my attention as we rode by on our countryside tour. She waved at every car that came her way and even threw rose petals at some of the vehicles passing by. How sweet! So many of us who “have it all” believe (albeit subconsciously), we don’t have enough and that we have nothing of value to give others. We use possessions to purchase acceptance and we’ll go broke trying to fix relationships that simply can not be repaired with more “stuff.” Money can’t buy joy, peace, or forgiveness. But a sincere smile, a contrite heart, a warm embrace, a wave hello, a kiss goodbye… these are the gifts that keep on giving. The kind gesture shown in this pic teaches that you don’t need a lot to give a lot. I’ll never forget this little girl and I pray she grows up appreciating all the wealth in her big heart. She embodies the true essence of paradise. This entry was posted in RESPECTFULly Yours and tagged Dominican Republic, Entitlement, Paradise, Punta Cana by The Practical Chick. Bookmark the permalink.